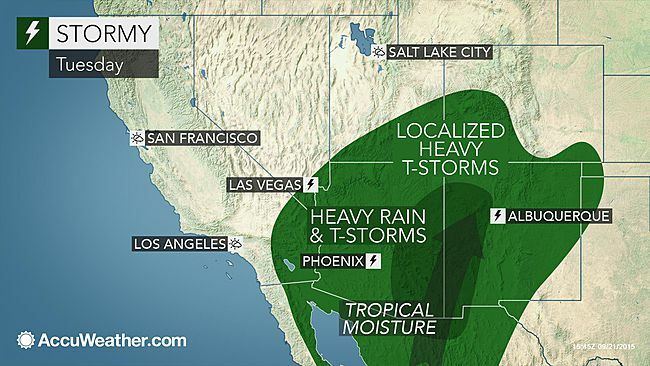 Heavy rain, thunderstorms and the risk of flash flooding will expand from northwestern Mexico through the southwestern United States into Wednesday. A surge of tropical moisture associated with once-Tropical Depression Sixteen-E will unleash an expanding area of torrential downpours and locally gusty thunderstorms. The downpours could be more widespread and heavier than the typical storms. While the atmospheric event will bring beneficial rain to some drought-stricken areas and greatly aid firefighting efforts, the same system will threaten lives and property. The combination of heavy rain and rocky, rugged terrain in the region will lead to the risk of flash flooding and mudslides. "While rain will wrap into Southeastern California and can lead to some flash flooding issues, most of the downpours and greatest threat for flooding will spread from Baja California to Arizona and New Mexico into Tuesday," stated AccuWeather Senior Meteorologist Kristina Pydynowski. Rainfall in this swath is likely to average 1-2 inches (25-50 mm) with local amounts of 4 inches (100 mm) possible, especially along the southern- and southwestward-facing slopes of the mountains. Even where rain may seem insignificant at a particular location, a torrential downpour over a nearby mountain or canyon could lead to flash flooding within minutes. Remember to never attempt to drive through a flooded roadway. To do so could not only put yourself and other occupants in your vehicle at risk, but also your would-be rescuers. The risk of debris flows (mudslides and landslides) will be greatest in, but not limited to recent burn areas. According to AccuWeather Meteorologist Courtney Spammer, "Baja California and the west coast of the Mexico mainland were the first in line to experience the disruptive and dangerous downpours this weekend." Residents and those traveling to Palm Springs, California; Phoenix and Flagstaff, Arizona; Durango, Colorado; St. George, Utah; and Albuquerque and Gallup, New Mexico, should expect disruptions and localized flooding. "Most of the downpours and flash flooding risk will be to the south and east of San Diego, Los Angeles and Las Vegas," AccuWeather Meteorologist Brett Rathbun said. 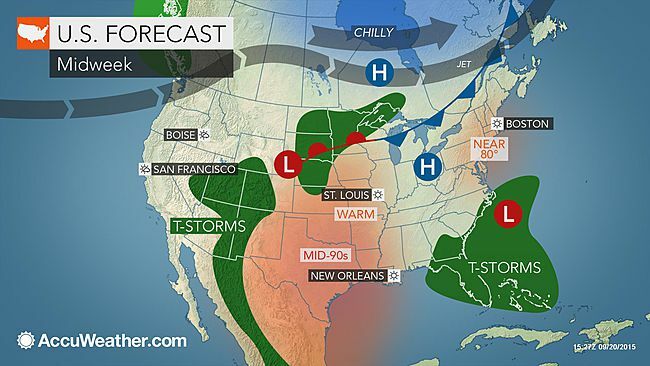 Toward the middle of the week, the downpours may become more sporadic and are likely to lift northeast of Southern California and Arizona. However, there will still be the potential for highly localized flooding in portions of Utah, Colorado and New Mexico. "Los Angeles has already recorded 2.39 inches of rainfall this month, or 10 times that of average," Rathbun said.